We are just a few weeks at the beginning of the KOH week and here is all the information about the 13th edition of this fantastic event. King of the Hammers has achieved a huge notoriety among all offroad enthusiasts, so much so that it is considered the toughest one-day race in the desert. Every year in California, the first week of February is dedicated to the KOH week. One week full of race and show. King of the Hammers, founded in 2007 by Dave Cole and Jeff Knoll, takes place every year in the Johnson Valley. Johnson Valley is a small unincorporated community in San Bernardino County in Southern California between the Victor Valley and Morongo Basin areas of the High Desert region of California. It is located north of Highway 247 in the Mojave Desert, and north by northwest of Yucca Valley. It is bordered by the San Bernardino Mountains to the south, Lucerne Valley to the west, and Landers to the east. The 13th annual KOH week will start with Hammertown opening to the public on Friday, February 1st, and will continue through Saturday, February 9th. The actual King of The Hammers race will take place on Friday, February 8th. The week consists of multiple qualifiers and races for a variety of classes racing from UTVs, to unlimited 4 Wheel Drive classes. A new desert race is coming to the 2019 King of The Hammers (KOH) Week lineup. The Toyo Tires Desert Invitational Presented by Monster Energy will feature 30 elite off-road desert racers in an invitation-only, traditional open-desert, off-road truck race in Johnson Valley. Who wouldn't like to drive the King of the Hammers race course with their Jeep? Thanks to Tony Pellegrino and GenRight Saturday 9 February is possible. Along the way, Jordan, Jami & Tony will be telling stories from race day at each section of the course or obstacle. We will be taking you to remote areas of the Johnson Valley OHV area, where most people have never been. You will experience the Hammers like you have never seen before! Only 6 drivers won the 12 King of the Hammers. Shannon Campbell is the only one that won 3 times. Jason Scherer, Loren Healy, Erik Miller and Randy Slawson won the race 2 times. Hammrtown is the incredible and unique city that as it rises from nothing and fades just as quickly is build after the race. 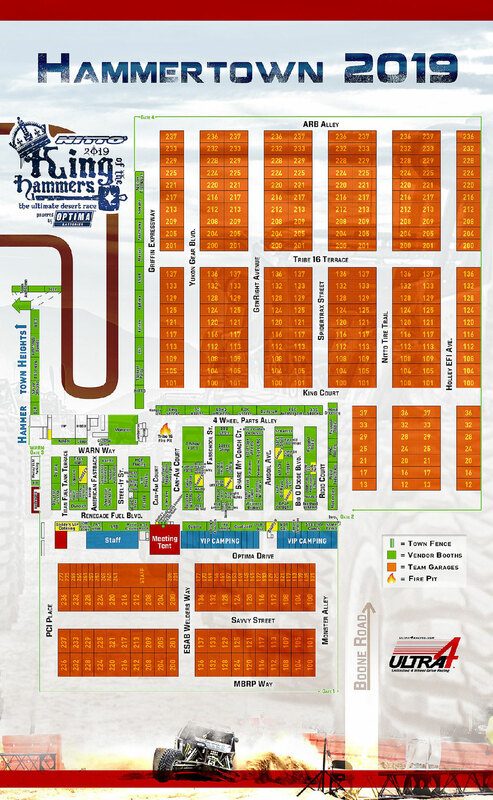 In Hammertown you can find all the teams in race and the vendor booths. 2019 HAMMER TOWN ADDRESSES ARE HERE! In Portugal, september 2018, Dave Cole has dropped a "bomb" announcing that for the next three years the best european drivers will be able to participate in the King of the Hammers. Here the 6 European teams that will participate in KOH 2019. But, for Ultra4 Europe it's not all. There are still two top drivers who will be involved in the Lakebed: Robert Butler and Jim Marsden. 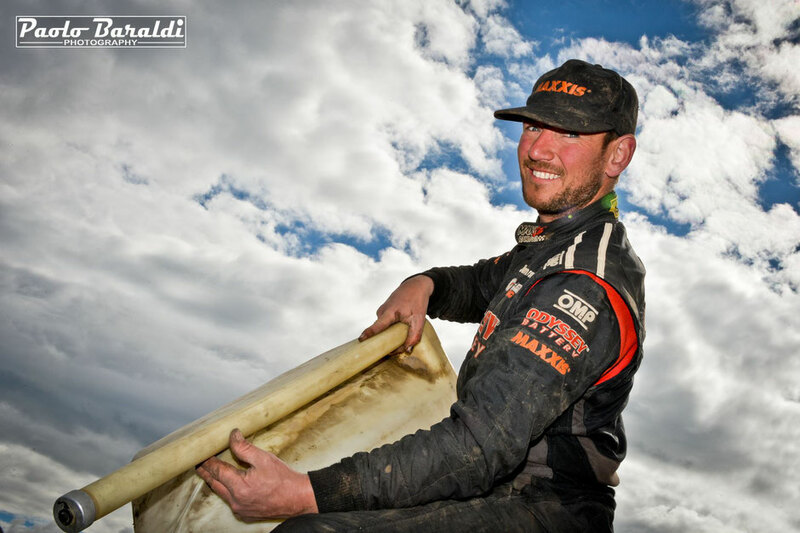 Rob Butler in 2015 participated in the King of the Hammers with his Eurofighter. He was the first European to finish the KOH on board a rig completely built in Europe. In that year Levi Shirley finished third at the King of the Hammers. In 2014 Shirley was the Ultra4 Europe champion. Rob Butler is one of the top drivers of Ultra4 Europe and an excellent Ultra4 car builder. This year Butler will be the co-pilot of Shirley in the Every Man Chalenge. Jim Marsden is one of the most titled and charismatic European drivers. He was in the Johnson Valley with his old car in 2013 and was the star of an epic Every Man Challenge: Jim started from the last position and he passed the finish line first. In that year he also race the King of the Hammers. Jim Marsden has been the official speaker of KOH Week for several years, and this year he will be on stage to comment the races and the actions of his European colleagues.